In 2013, a group of Massasoit Community College students established the Massasoit Food Pantry on the Brockton campus to assist our students and staff in need. The food pantry is located on the first floor of the Field House and is open Monday-Friday, 11:00 a.m.-1:00 p.m. during the weeks that classes are in session or exams are scheduled. If you are a Massasoit student or staff member and need help feeding yourself or your family, please stop by. 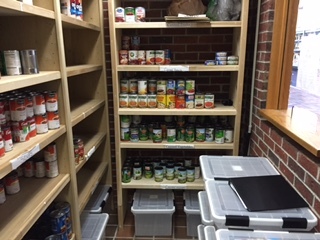 Donations of non-perishable foods are always needed and welcome to keep the pantry stocked. The following items are especially needed right now: peanut butter, tuna, cereal, rice, pasta, and pasta sauce. If you have questions about the food pantry, please contact Patty Lynch, Associate Dean for Experiential Learning, Civic Engagement, and Perkins Programs (ext. 1018, office in Student Center, Room SC 1883).